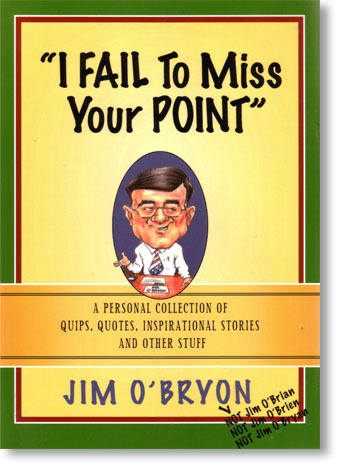 "I FAIL To MISS Your POINT"
With this book you can amaze your friends and family with tidbits of brilliance, you'll astound your associates at the next meeting with relevant and influential illustrations. Nearly 500 pages, and two and half pounds of witticism and wisdom. You need this book. 19.95 + 5.00 shipping and handling. Each book will be personally autographed! This book contains a lifetime of wisdom gathered from thousands of speaking engagements and trips around the world for business and ministry. Culled from real life, wisdom from others, and family experiences, this book is a great resource for wisdom sayings, tidbits, and illustrations that you can't find anywhere else.